Cameron O’Connell is a Jack-of-All-Trades and Master of Some. He writes The Phantom Queen Diaries, a series in The Nate Temple Universe, about Quinn MacKenna, a mouthy black magic arms dealer trading favors in Boston. All she wants? A round-trip ticket to the Fae realm…and maybe a drink on the house. 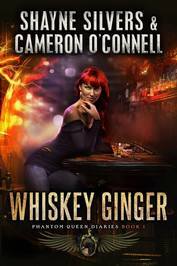 A former member of the United States military, a professional model, and English teacher, Cameron finds time to write in the mornings after his first cup of coffee…and in the evenings after his thirty-seventh. Follow him, and the Templeverse founder, Shayne Silvers, online for all sorts of insider tips, giveaways, and new release updates!